When Georges F. Keller began donating paintings by masters like Henri Matisse and Salvador Dali to the Kunstmuseum in Bern, his reputation was not in doubt. The Swiss-Brazilian national had been a respected art dealer who gifted 116 works to the museum from the 1950s until his death in 1981. But last year, the Kunstmuseum's provenance researcher came across an archival document linking Keller to Etienne Bignou, a Frenchman now considered a "red-flag" dealer because he traded art with Germans in Nazi-occupied Paris. For the Bern museum, the potential fallout of gifts with possible Nazi ties was not new. The museum was the sole heir of hundreds of major pieces left behind by Cornelius Gurlitt, who died in 2014 and whose father, Hildebrand, was tasked by the Nazis with selling art stolen from Jews or confiscated as "degenerate" works. The case captured huge global attention and the arduous process of trying to restore the Gurlitt treasures to their rightful owners is ongoing. But there are signs that the Gurlitt ordeal, with the heavy legal and historical responsibility accompanying the artworks, has changed attitudes across Switzerland about an institution's duty concerning suspect art. "I clearly see a before and after the Gurlitt case," Kunstmuseum director Nina Zimmer told AFP. "The climate has changed, the tone has changed, the questions have changed and I think we all agree that it is part of the museum's task to look at where the collections come from and to deliver answers," she said. Who was Georges F. Keller? Keller and Bignou worked together in Paris at the Gallerie Georges Petit, which specialized in Impressionist works, until it closed in 1933, according to archives published by the Frick Art Reference Library. Bignou then set up his own eponymous gallery in the French capital with Keller, who also had French nationality, as his partner. Keller later became the director of the New York branch of the Bignou gallery, the archives show. Amelie Ebbinghaus, a provenance researcher at the firm Art Loss Register, said that documents from both the French state and the Allied powers indicate that Bignou traded with German buyers in Paris and was identified at the time as a "collaborator." "That obviously doesn't mean that the works came from problematic sources, but it can't be ruled out," she said. 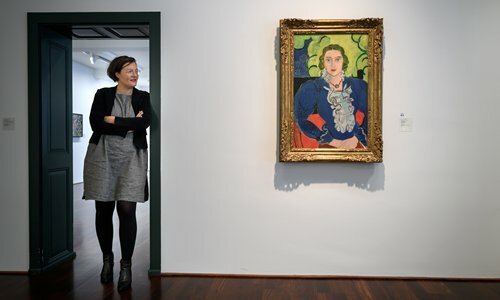 It is not clear what Bignou's potentially dubious connections mean for the works Keller gave to the Kunstmuseum, including Matisse's The Blue Blouse (1936), which depicts a young woman in bold, primary colors. Zimmer told AFP that she had her own questions about Keller before the Bignou connection was established, since none of his donations to various Swiss museums had come with documentation. "I was always curious," she said. "We have almost zero knowledge of where these works came from before he gave them to us." But once the Keller-Bignou link was confirmed, it was "immediately clear that we need to know more about these works," she said. The Bern museum has applied for federal funding to conduct a full audit of Keller's legacy. That approach - and new Swiss government grants for provenance research - point to changing practices in a country with a mixed record on Nazi-looted art. "Switzerland had the position that it was a neutral, free country and that any trade that happened in Switzerland in the period of 1933 to 1945 was not affected by the Nazis," Ebbinghaus said. But that view was not necessarily shared by other countries, who pointed to artworks sold in Switzerland at cut-rate prices by Jews fleeing the Nazis, she said. In the late 1990s, Switzerland and others came under pressure to probe their World War II-era history, not only in looted art but also bank accounts and gold deposits. A 1998 landmark international agreement on returning art stolen by the Nazis known as the Washington Declaration was drawn up. The question of what constitutes looted art, as well as research suggesting that possibly thousands of works held in Switzerland were sold by Jews under threat, continue to provoke debate. However, Swiss museums and auction houses are increasingly showing caution in handling problematic pieces, Ebbinghaus told AFP. Establishing ownership of a looted piece, let alone identifying a rightful heir, is notoriously tricky. This has been highlighted in prominent cases such as the battle between an American descendant of Jewish Holocaust victims and Austria's Belvedere Museum over masterpieces by Gustav Klimt which featured in the 2015 film Woman in Gold starring Helen Mirren. Zimmer said the challenges for Switzerland were a lack of qualified provenance researchers and limited funding. But she identified private archives as a roadblock that threatens all provenance investigations. "Sometimes you make great progress and then you find out that the exact next document you need is in a family archive and you need to convince them to open it for you," she said. And that can be quite a tall order, she added. She stressed that the Bern museum would continue to push for more provenance research by building ties with universities and creating programs to cultivate a new generation of specialists. "We need to dive deeper in there, and we will," she said.